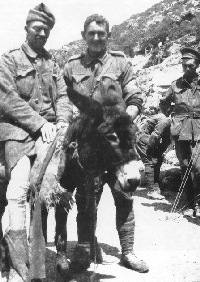 Simpson’s Donkey - ‘Duffy the Donkey’ transported injured soldiers to safety at Gallipoli, with his owner John Simpson. The now famous pair ‘Simpson and his Donkey’ became the epitome of sacrifice and courage in the Anzac spirit. ‘Jim the Donkey’ is a well known character at Heidelberg Repatriation Hospital. For many years Jim has attended the traditional ANZAC Day Service in the Remembrance Garden at Heidelberg Repatriation Hospital. He symbolises the care and compassion shown by Simpson and his Donkey at Gallipoli.